(Newser) – Charles Darwin discovered them in 1834, during a stop in Chile by way of the HMS Beagle, a species unique in that "the males care for their young by incubating them in their vocal sacs for at least part of their development." Now, one of the two species found by and named after him can only be referred to in the past tense. 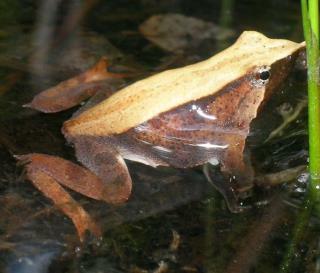 Researchers believe the northern Darwin's frog (Rhinoderma rufum), last seen in the wild in 1980, has been wiped from the planet in part by the skin-infecting fungal disease chytridiomycosis; the population of the southern Rhinoderma darwinii has plunged precipitously, reports Reuters. The findings, published last week in PLOS ONE, were the work of Chile's Universidad Andres Bello and Zoological Society of London. Noted a professor with the latter: "Only a few examples of the 'extinction by infection' phenomenon exist." As humans continue to breed like rats, our little biodome cage will continue to dwindle in diversity and quality.